My friend Court! 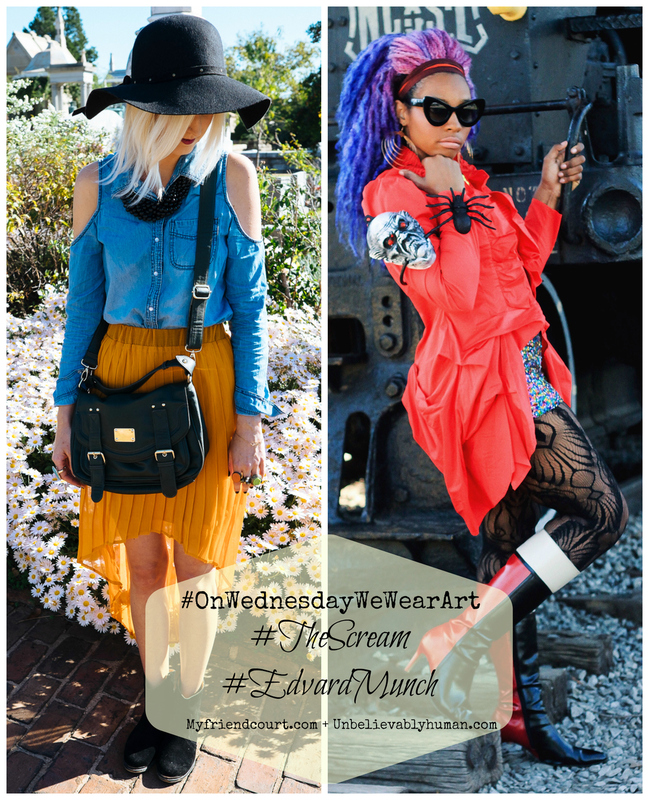 Had the best idea that I have heard in a long time and that is #OnWednesdayWeWearArt! Exciting right! It’s really the coolest thing! Naturally I gravitated to it! Because personal style is all about expression and Art is Expression! So why not have a day set aside to celebrate Art and it’s inspiration in the way style ourselves! I am too excited to be a co-collaborator and new addition to such a FANTASTIC and FUN Idea. Courtney and I will be sharing our respective takes on the same art inspo prompt, and our personal style looks that came from the art “prompt”. We have no clue how the other experienced the art (or wrote/or styled their look) until ON Wednesday[when] We wear ART! Cool huh?! I love this for UH for so many reasons. It gives us a chance to explore how to directly correlate how everyday creativity can inspire art, and how simplistic art is. Art isn’t just relegated to Fine artist like painters, sculptors and the like. Art includes you and your daily expression of your feelings, your emotions, and most importantly YOUR point of view on the World, your Life or maybe the color pink. Whatever the case through these prompts I’ll share my discoveries of how each artist used his “medium” to express, in some shape or form! Hopefully this will spark inspiration to find ways to do the same, albeit in a less literal way! Like nail art, baking, or joining us #OnWednedayWeWearArt on instagram ! We'll be sharing our favs!!! Which brings me to this weeks prompt! 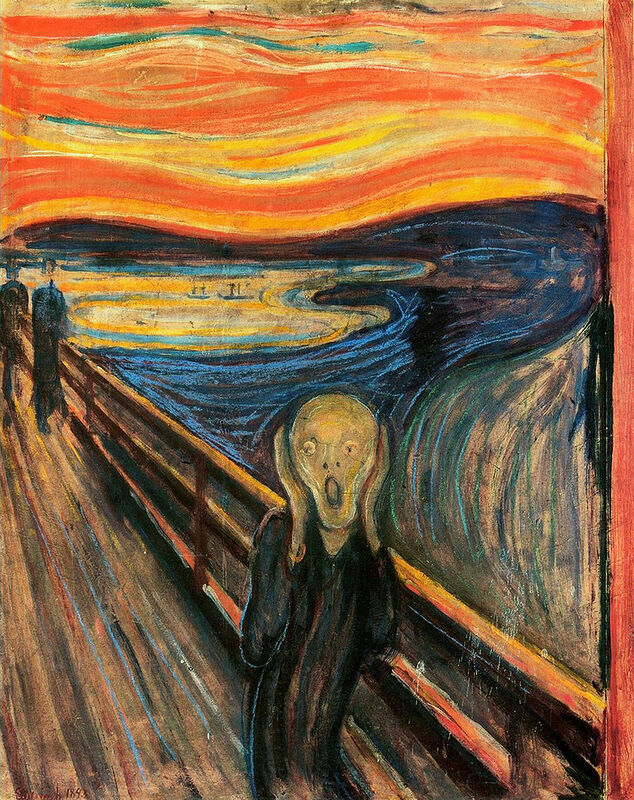 Edvard Munch’s Scream (In honor of Halloween!). Edvard was an expressionist which basically means that instead of focusing on technique and making his picture look “real”, like in realism art, he used his paint brush, paints,lines, shapes and most importantly color to give a visual account of his emotions! This painting although scary in some ways seems comic. I think it’s because of the loan face that the artist has allowed in the painting. The swirling lines and colors make it look like hell on earth and the soul of the screamer being whirled away into the tornado of colors in the painting. "I was walking down the road with two friends when the sun set; suddenly, the sky turned as red as blood. I stopped and leaned against the fence, feeling unspeakably tired. Tongues of fire and blood stretched over the bluish black fjord. My friends went on walking, while I lagged behind, shivering with fear. Then I heard the enormous infinite scream of nature." How’s that for expression. Hard to imagine that he saw all of that, huh! But he did! I kinda think that Edvard, might have been feeling down about life this particular day. And went out for a walk to cheer up. You know, get some fresh air. But then his chest felt to heavy to get a deep breath and he succumbed to feeling like his life was a living hell! and so he SCREAMED! #beentherefeltthat Totally relatable! Full disclosure: Edvard did struggle a bit with mental illness, and used art as his outlet to stay sane. How Unbelievably Human of him! Speaking of Unbelievably Human Expression, As far as my #onwednesdaywewearart look! Another disclosure: Anything that sparkles is a neutral to me! Ok now that that’s stated, My mom bought me the shirt and boots that I am wearing in the photo and my brother got me the shorts for Christmas. I wanted to play with the use of a solid vibrant color(Top), multicolored sequins(shorts),color blocking(boots) and patterns(tights). For me this was an expression of my fearlessness and courage to both honor what makes up who I am as a person and go after all of the things and people that I love. Intentionally bringing them all together each day to create a life and memories that I can dance about instead of scream about! What about the hair? Well I’ll cover that in another post! Also check out Courtney's Post about the same piece here!